Monkey BOY heads. There are a total of 7 files and they're perfect to use in most graphics programs. Each clip art is presented in a transparent PNG format in 300 dpi resolution. 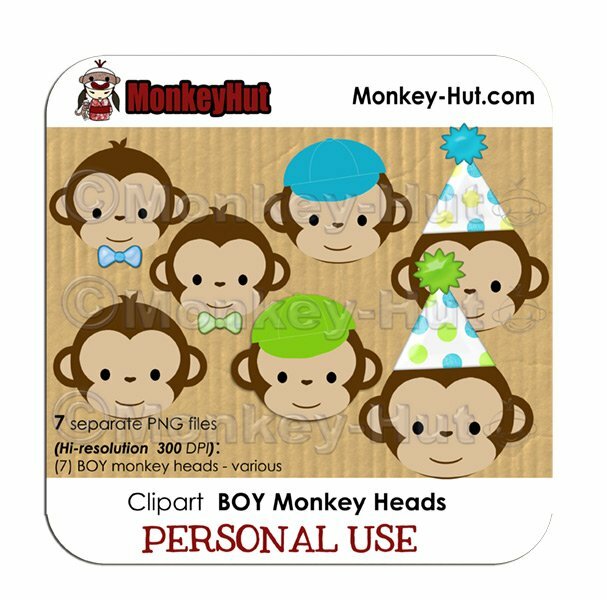 The clip art may be printed onto any paper and is fully editable to whatever size you desire. It's perfect for creating invitations, announcements, scrap booking, cards and more. Your clip art will be delivered to you via email within 48 hours of purchase and completed payment. All images are high resolution/300 dpi. This listing is for PERSONAL USE ONLY and CAN NOT be used on any items created with intent to sell. If you would like the COMMERCIAL USE set, please don’t hesitate contact me.